Work on the Union Pacific began slowly and not productively. Mobile Credit was established to siphons funds from the railroad. The Union Pacific did not begin serious building until General Dodge was placed in charge of construction. The Union Pacific with its crew of Civil War veterans and Irish workers then began laying a mile of track a day across the plains. Its greatest impediment lay in the Indians who did not appreciate the encroachment of the railroad across their hunting lands. On the California side the Central Pacific was not hobbled by the financial shenanigans of the Mobile Credit, nor did it have to deal with hostile Indians. It managed to pacify the Indians by giving them free passes on the line. The Central Pacific's main obstacle was the terrain and the weather. Before the CP had traversed many miles it was forced to make its way across the Sierra Nevada. Work proceeded slowly through the snow and often through solid rock. 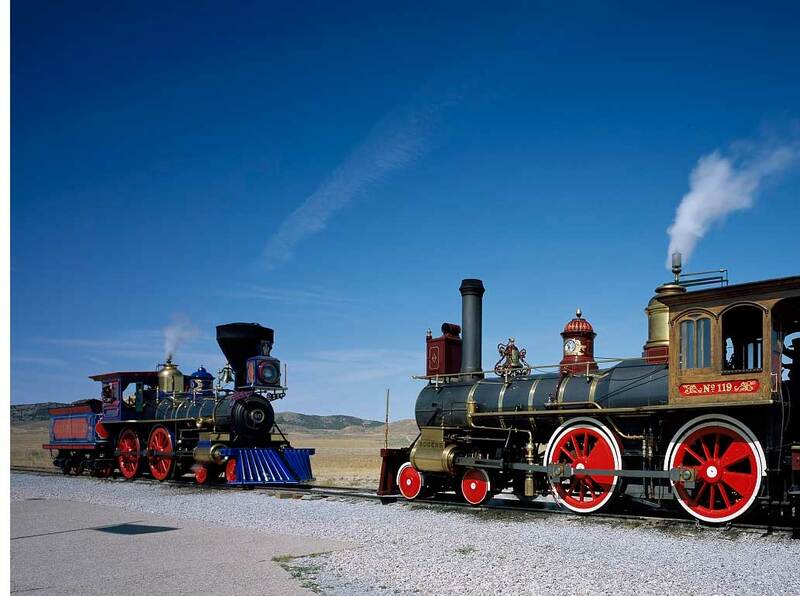 By the time the Central Pacific had made it through the Sierra's and the Union Pacific made it through the Rockies the race was on-whoever could lay more track would receive more money. The Central Pacific set a one-day record when it laid 10 miles of track. The construction crews passed each other, on parallel tracks. Finally Congress was forced to decide were the lines were to meet. Promitory Point Utah, was set as the point. On May 10, 1869 the rails met at Promontory Point. The news of the events was telegraphed immediately, to the rest of the nation. The whole nation celebrated the linking of the East and West Coast. The United States was never the same again. It was now a united nation linked by steel rails.